Blaze Bernstein, a gay Jewish man, was stabbed 20 times and left to die in an Orange County park this past January allegedly by a proclaimed white supremacist. On Oct. 31 the Beth Jacob Congregation Synagogue in Irvine was vandalized and “F*** Jews” was spray-painted on the front wall. Anti-Semitic sentiment has surged in the past couple years, especially after the election of President Donald Trump. There was a 35 percent increase in anti-Semitic incidents in 2016, and a 57 percent increase from that figure in 2017, according to a report from the Anti Defamation League. 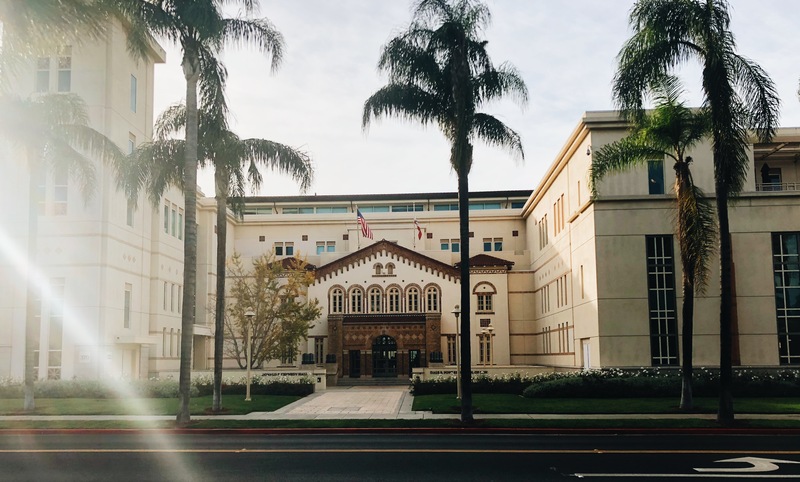 Though Chapman has a strong Jewish community and 10 percent of Chapman students identify as Jewish, these local anti-Semitic hate crimes have some students and faculty apprehensive to outwardly display their faith. 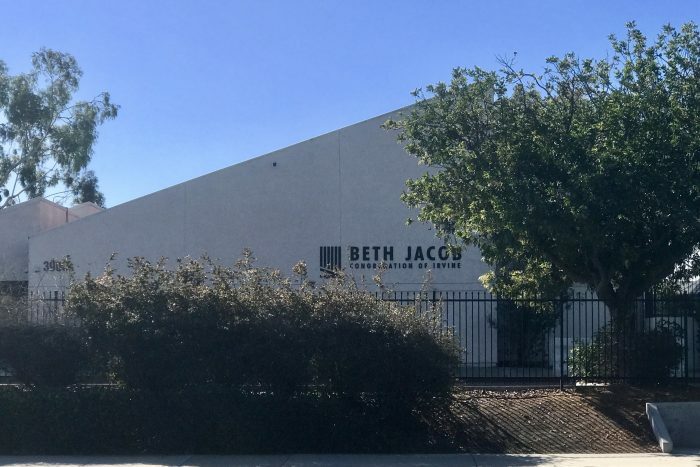 The graffiti on the Beth Jacob Congregation of Irvine has since been covered and security stands at the gated entrance. Photo by Kathryn Bernhardt. One Chapman student was driving in the car wearing a kippah, a traditional Jewish head covering, and “he decided to take [it] off when driving because people could see it because he was scared for his own safety,” said Carson Shevitz, a junior business administration major. 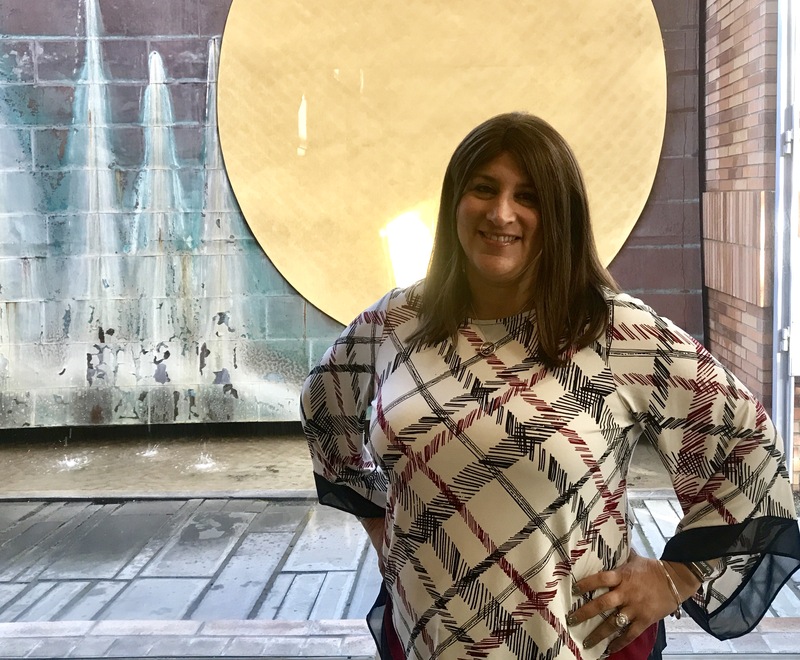 Even putting up Hanukkah decorations can elicit anxiety these days, said Rabbi Corie Yutkin, who was hired last year as Chapman’s first Director of Jewish Life. Nationally, there have also been staggering attacks targeting Jews. On Oct. 27, the Tree of Life Synagogue in Pittsburgh was attacked and 11 Jewish people were shot and killed. This is believed to be the deadliest assault on the Jewish community in American history. 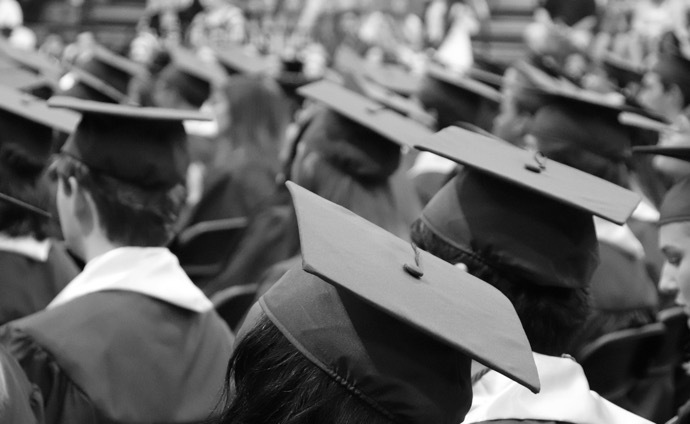 More recently, swastikas and the derogatory term “Yid” were spray-painted across a Jewish professor’s office at the Columbia Teachers College. Despite the number of these attacks increasing after Trump’s inauguration, some Chapman Jewish students don’t think there’s a correlation. “I wouldn’t blame it on the political climate, I would blame it on different changes in how people are raised to have tolerance and understand people of different backgrounds,” Shevitz said. Shevitz declined to comment on why he thinks tolerance has decreased so much in recent years. “Our president right now is very pro-Israel and he hasn’t said anything that could possibly inflame people to the point of doing what has been done,” said Alex Sax, a sophomore sociology major. However, President Trump has a long history of hateful rhetoric. 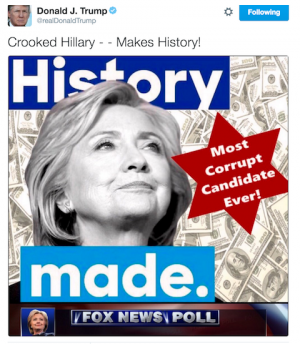 He referred to some of the white supremacists at the Unite the Right rally in Charlottesville as “some very fine people.” In 2016 he tweeted a picture of a six-pointed star next to Hillary Clinton, with money in the background, which some critiqued as having anti-Semitic implications. Instead of drawing a parallel between Trump and the hate crimes, some Chapman Jews think the events are due to the current polarization of the two main political parties in the country. “Everything is just more polarized and this polarization that’s causing the political climate to be so nasty is the same cause of the increase in anti-Semitism,” said Daniel Levine, the Director of Jewish Life for Chapman Hillel. Furthermore, many Jewish people at Chapman believe that anti-Semitism has been around for ages. Perhaps, they say, it only looks like a recent rise because of the media’s increased coverage of the issue and the change in culture that seems to allow these biases to be talked about openly. “It’s not a new phenomenon. Anti-Semitism isn’t a brand new thing, but [white supremacists] feel more comfortable saying whatever’s on their mind because they feel that they have the support group,” said Jacque Rabie, sophomore film production major. “There’s sort of this culture that it’s OK to talk about white nationalism and white pride, and this idea that even if those feelings have been there before there’s been this whole level of permission that’s been given that says it’s OK and really it’s not OK,” Yutkin said. Anti-Semitic sentiments can now be seen and tracked more easily because of social media. People feel more comfortable saying their true feelings behind a screen and can more easily find like-minded communities. “Part of the fear of the American Jewish community right now is a rise or at least more public showing of classical anti-Semitism like the kind of thing that you would see in Europe in the ‘30s,” Levine said. “More of these sentiments are typed out on a daily basis on Youtube and Twitter now. And that’s the sort of thing that before social media your average person wouldn’t just stumble across,” he continued. 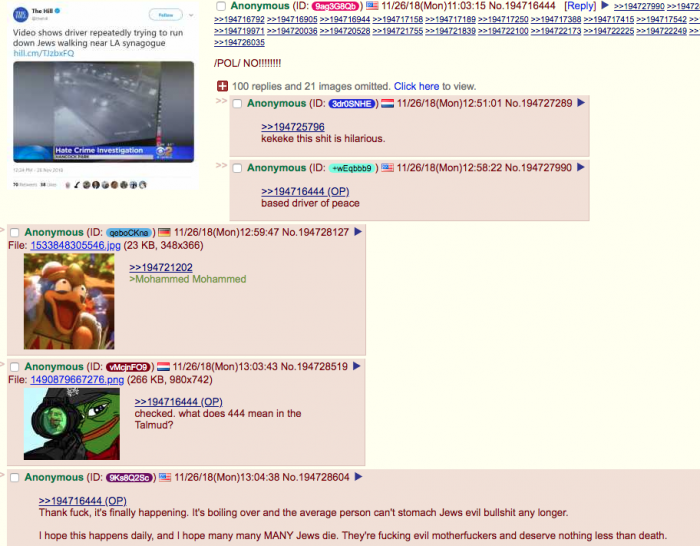 The word “Jew” in combination with pejorative terms for Jewish people almost doubled between July of 2016 and this January on the “Politically Incorrect” discussion board on 4chan, an anonymous online messaging system, according to findings of the Network Contagion Research Institute. The researchers found that although this site is small next to social media giants like Twitter and Facebook, it directly influenced online conversation by passing nasty rhetoric to mainstream media platforms such as Reddit and Twitter. Social media and the Internet have become integral in making communities for these kinds of people, said Jeremy Blackburn, an assistant professor of computer science at the University of Alabama at Birmingham and one of the researchers on this project. “Hate rhetoric at the top of society has contributed to more hate crimes at the bottom,” said Jack Levin, a professor of sociology at Northeastern University. But even though there is this correlation between Trump’s presidency and the increase in hate crimes, some don’t think this will influence his supporters’ opinions of him. “They turn a blind eye to certain things. If he has one policy that you agree with then you can kind of just focus on that like ‘oh, the bad stuff he says, it’s not really him’. They can just focus on what they want to focus on,” Rabie said. The fact that people see Trump as a spokesperson for these ideas, whether he is or not, motivates people on the fringe, said Edward Dunbar, a clinical professor of psychology at UCLA who recently wrote a book called “Hate Unleashed: America’s Cataclysmic Change” about Trump’s use of language in terms of bias and discrimination and its relationship to his election as president. Despite the differences in opinion on who or what has caused the increase in anti-Semitic incidents, everyone agreed that no matter the cause, it’s most important to come together to support each other and condemn it. This table of candles is now always up in the Fish Interfaith Center for anyone who wants to light a candle for a victim of the Pittsburgh shooting or to show their solidarity with the cause. Photo by Kathryn Bernhardt. 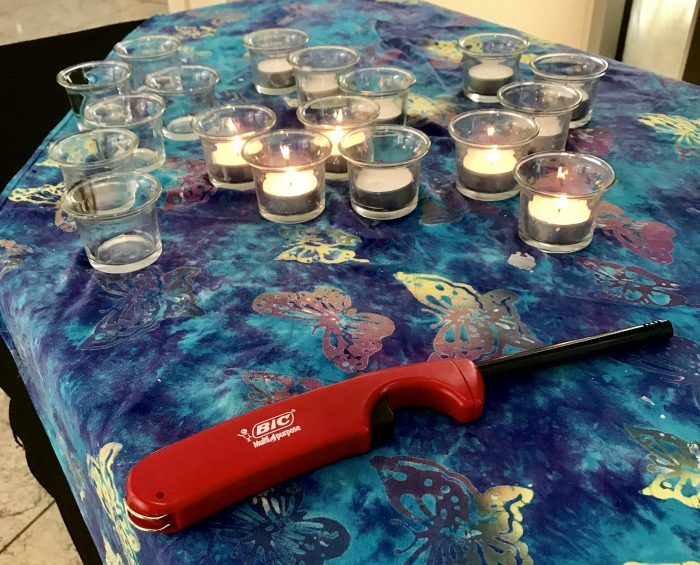 Chapman held a candlelight vigil in the Fish Interfaith Center days after the Pittsburgh shooting to support the Jewish population on campus and anyone else who had been affected. Members of Alpha Epsilon Pi, the Jewish fraternity on campus, also went to the synagogue in Irvine and attended a service after the vandalism. In addition, they organized a fundraising event for the families of the victims in the shooting, where they were able to make more than $700 in just four hours. 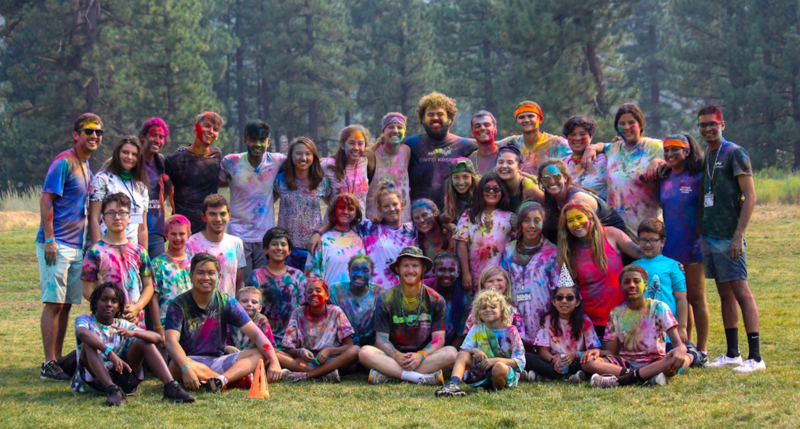 “We were all astounded by how much money we raised and from the second we sent out the poster for it, we got such a huge response, even people donating from out of state for it,” Rabie said. 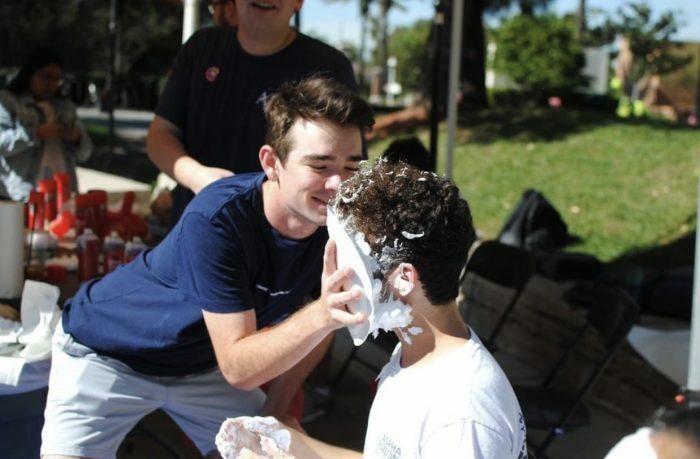 Jack Clendening smashes a pie in the face of his AEPi brother at their Pie a Pi fundraiser. Photo credit: Chapman AEPi. While we need gun control and better educational improvement, the most important thing we can do is consider diversity a strength of our country and not a weakness, said Gail Stearns, dean of the Wallace All Faiths Chapel and associate professor of religious studies.